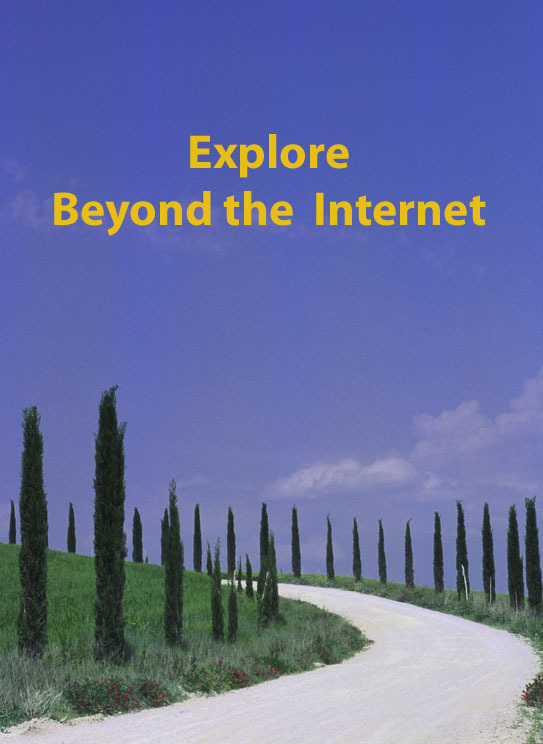 Shauna Hicks is writing a 52 week series on genealogical records to “stimulate her genealogy blogging efforts”. She’s invited us to join her on the journey and while I’m behind, how could I miss out on the Week 7 topic: local histories…. after all they take up a fair bit of my bookshelf space. 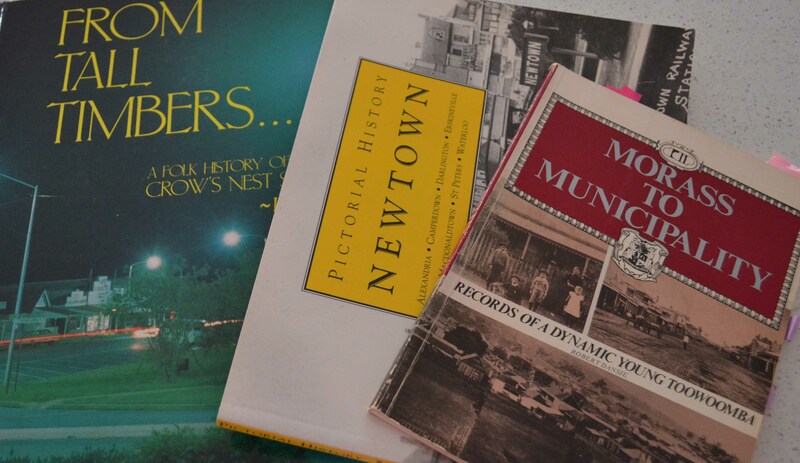 Local histories tend to come in all shapes and sizes, and sometimes those tiny volumes can include significant information. Only rarely will they specifically mention one’s own family, but that doesn’t matter. Our families aren’t islands and they share their community with their friends, associates and neighbours (FANs) as well as, possibly, other family members. Anything which expands our knowledge of the family’s community adds texture and richness to what we know of family stories and – it may even break down brick walls. 1. “Anecdotal” local histories which draw on the memories of those who live(d) there. These are often chatty, informative stories but can be very subjective, which is not to say they are incorrect. Rather that the reader needs to weigh up what they’re being told. I feel sure that if you’ve ever had a conversation with a spouse or sibling, you’ll recall instances where you each remember an event completely differently. For me, the weakness of this type of history is that often only a select group of people are interviewed, or choose to be interviewed, which lends a bias to the overall history. I wrote about this, in part, in an earlier blog post. Better than no history, of course, but leaving one craving more, or just wondering. Nor does this type of local history tend to include broader historical context so we can judge if the community’s experience is typical or uncommon. These may be somewhat esoteric and seem too dense to bother with at times. However because they have to be reviewed by academic peers, they generally have more depth. What they lack is often a sense of the individuals who lived in the community, though they are certainly a bridge between the individual’s experience of history and national or international perspectives. They may exist as published histories but it’s also worth searching local universities to see if a Masters or PhD student has written a thesis on your area of interest. I struggled to find a term which satisfied me for this category. These may include a blend of broader history together with the story of the specific community and its circumstances, as well as some of the families who lived there. 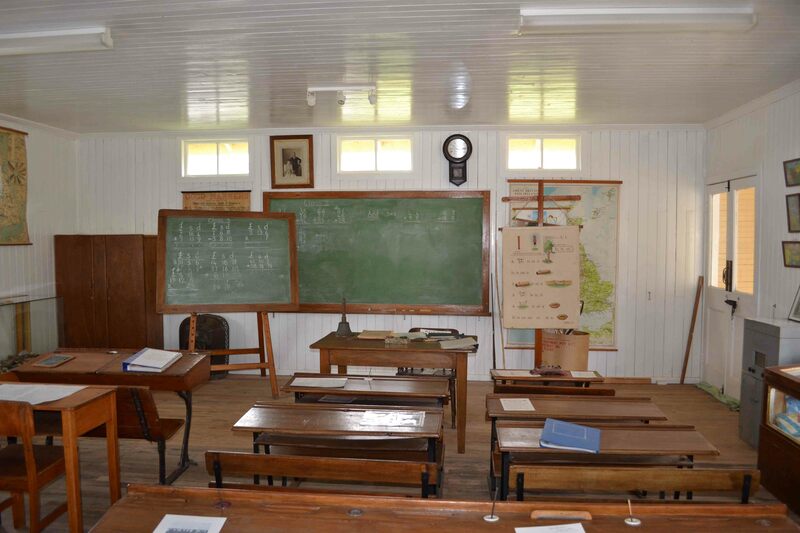 Crows Nest Folk Museum & Village, Queensland. Although they offer less depth than any of the above, pictorial histories can bring the stories to light more clearly by showing you photographs or paintings of communities or regions either currently, or contemporaneous with when your family lived there. I’m sure this wasn’t what Shauna had in mind but why not consider the local history that a local historical museum can offer you? It may be they also have a small publication on the area which you won’t find elsewhere, but they’ll have artefacts and perhaps buildings which show you how your ancestors lived. I wrote about these, as well as local histories, in my 52 weeks Beyond the Internet series in 2012. What does it mean to study local history? How do we know the best ways to study local history? I have quite a few of these types of books too, thanks to my study for an Advanced Diploma in Local History. So what’s my favourite local history? You can see from all the tags how much info I’ve got from these two books. Hands down I’d have to say the book Dorfprozelten Teil II written by Georg Veh in collaboration with members of the community. I’m forever dipping into it for my own family and that of the other Dorfprozelten emigrants. A phenomenal amount of work has gone into it, listing as it does the residents of this Bavarian village from 1844 when the first land register was prepared. 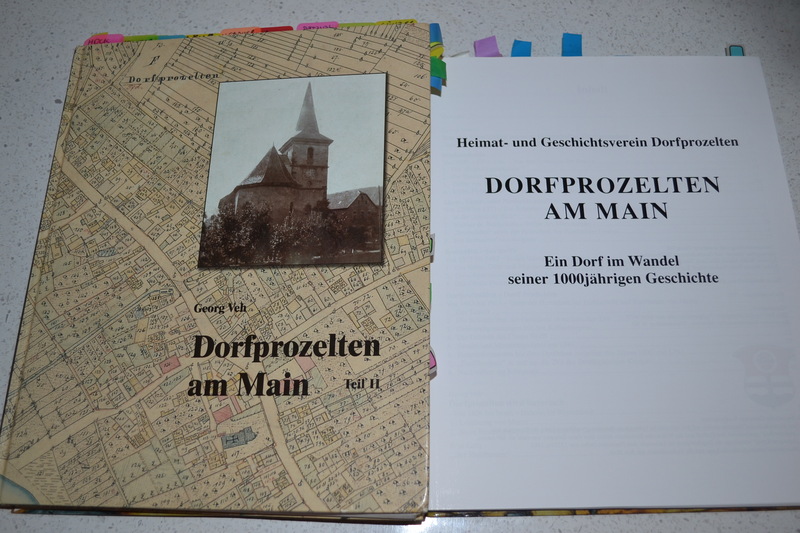 Not only that, it includes a plethora of BDM details for many of the families, as well as photographs of the community which make it easier to understand the village irrespective of whether the reader understands German. This is of course perfect for research into the families and individuals who not only lived in the community but who emigrated. In fact a section of the book called be sub-titled “Inns and Emigrants”. In this I was very fortunate personally as my ancestral Happ family had owned an inn in the village for at least 150 years. This book gave me wonderful information, and photographs, which I was given permission to include in my Kunkel family history. In terms of the emigrants, there’s no indication in the book of where the information was sourced. I am culpable in regard to the Australian-bound emigrants. What I provided to Georg at the time has been added to, and in some cases amended, as my knowledge has grown of their experiences –sometimes after repeatedly hassling poor Georg to clarify particular family details. Frustratingly, albeit understandably, there is no index but I have prepared a partial one for my own use. So there you have it. Hopefully some of this will offer food for thought, and an inclination to give local history a whirl to add flavour to your family history. I truly believe it’s impossible to do a well-rounded family history without looking at your family’s community. As well as finding books on e-bay (use Google alerts) or select bookstores, I’ve just found this site, ISBNS.net which might prove helpful to you and which I can see becoming a firm favourite of mine. And don’t forget if you live near an Australian reference library you will be able to submit an inter-library loan for any books held by the National Library of Australia. 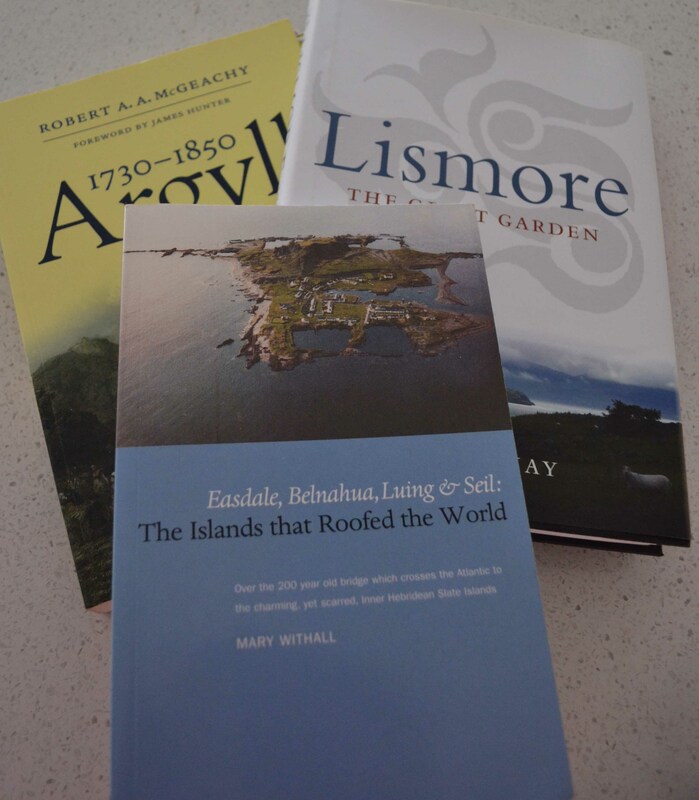 Argyll 1730-1850: Commerce, Community And Culture. McGeachy, R A A. John Donald Publishers, 2005. Billabidgee: history of Urana Shire, Central Riverina, New South Wales. Bayley, WA. Urana Shire Council, 1959. Conrad Martens in Queensland : the frontier travels of a colonial artist. Steele, JG. University of Queensland Press, Brisbane, 1978. Dorfprozelten am Main: Ein Dorf im Wandel seiner 1000Jährigen Geschichte. Veh, G, Benedict Press 1995. Footsteps through Time: a history of Chinchilla Shire (two hefty volumes). Mathews, T. Chinchilla Shire Council, 2004. From Tall Timbers: a folk history of Crow’s Nest Shire. Crow’s Nest &​ District Tourist &​ Progress Association Inc., 1988. Herston, Recollections and Reminiscences. Hacker, DJ; Hallam DR; Spinaze, M. Queensland Women’s Historical Association. 1995. History of South Lochaweside. McGrigor, M. Oban Times Ltd, Oban, 1996. Lost Argyll, Argyll’s lost heritage. Pallister, M. Birlinn Limited, Edinburgh, 2005. Villages of Northern Argyll. Withall, M. John Donald Publishers, 2004. Vision Splendid: a history of the Winton Shire. Forrest, P and S. Winton Shire Council and Winton and District Historical Society, 2005. That’s not all folks but it’s surely enough for one day! This entry was posted in Books, Local History and tagged local histories, local history, shauna hicks by cassmob. Bookmark the permalink. Thanks Pauleen for showing so many different aspects of local histories. Something for everyone and I will put a link to your post from my website. Thanks Shauna! I’m sitting here pondering diaries… Sadly none specific in my family. Wondering why you have “A centenary of memories: The Dungog Chronicle 1888-1988” on your bookshelves. My Tierneys were early settlers in Dungog and their Kealy, D’aarcy and Keough cousins lived in the area as we..
Aha, I thought I’d catch you with that one _and someone else who has Dungog- but can’t recall who. I have that book because one of those dreaded Dorfprozelten emigrant families, the Hennig/Henny family, settled there. I find local histories informative, even when they are slanted. I agree Kristin, one just has to put on one’s judgmental hat, to weigh up the facts,accuracies and potential bias.